Key highlights include its new multi-purpose brine injector, the GEA MultiJector 2mm with flexible needles; the new GEA CookStar with in-line smoking application for super heat smoke; a new decanter series, GEA ecoforce for processing high quality animal by-products and a new packaging machine PowerPak PLUS. The new unique in-line freezer control system CALLIFREEZE®, which was launched during Anuga FoodTec 2018 in Germany, will now be presented to the North American market. As inventor of industrial injection, GEA will celebrate its 50 years of expertise by introducing the new MultiJector 2mm, an innovative continuous in-line injection solution developed for high quality and accuracy in the art of bacon making and poultry processing. The new equipment features unrivaled injection accuracy with a low standard deviation for excellent product quality and maximum profitability; flexible needles that will not break or distort, and maximum Time-in-Meat technique. The modular design includes exchangeable manifold needle cassettes for easy cleaning and quick changeover. Time-in-Meat is a GEA injection precision technique based on the specific combination of stroke height and injection cycle time, both optimized for each product type. Thanks to the Time-in-Meat technique, the needles stay in the product longer during injection, which leads to better brine uptake and more even brine distribution. As a result, product quality and consistency are significantly increased, and higher efficiency and yields can be achieved. At the heart of the GEA MultiJector are the unique 2mm OptiFlex needles which combine flexibility with special strength. They are four times stronger than traditional stainless steel and will flex and recover their shape, helping to prevent bent or broken needles and ensure consistent quality and maximum productivity. This help avoid over or under-cured areas for a more consistent taste and color. 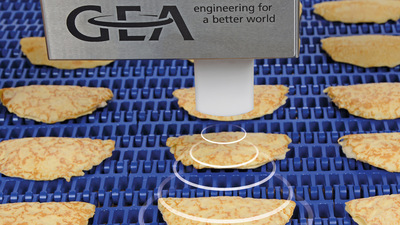 For more than 25 years, the GEA CookStar has been the leading oven in the food industry. The third generation GEA CookStar has evolved into a three-phase cooking concept, with the ability to cook any product in virtually any style. Combining the double spiral oven technology with the SuperHeatSmoke concept, enables food processors with in-line production to produce and brand their products with a CleanSmoke label. SuperHeatSmoke is the innovative and award-winning solution for in-line smoking of meat, poultry, seafood and meal components and is generated using a Red Arrow purified smoke condensate. The smoking process is conducted at temperatures above 100 °C. The oven provides a controlled environment for a more consistent smoke flavor and authentic coloring, similar to a traditionally smoked product. The technology further enables taste and color variation by using smoke condensate with various colors and flavor intensities and by applying smoke in one or both oven sections. The new freezer process control system CALLIFREEZE® continuously measures the level of product frozenness at freezer outfeed and adjusts freezing time, air temperature and fan speed to achieve the exact freezing quality with minimum energy consumption. The new system reduces power consumption and improves efficiency. The control unit can be configured for GEA S-Tec and A-Tec spiral freezers, handling a wide range of food products including meat, poultry and fish, ready meals, bakery and dairy products. The well-known thermoformers of the GEA PowerPak product family open up new possibilities thanks to a wealth of technical innovations. New features contribute to the objective of making the customer’s work easier, which means more efficient with improved packaging quality; reduced film consumption; simple handling, as well as safe process sequences and greater availability. The unwinding systems for both the top and bottom films in the GEA PowerPak PLUS are motorized and synchronized with the machine’s advancing cycle. In combination with the innovative web tensioning system, they facilitate a controlled unwinding and a simplified and secure film path. For top and bottom films, it is also possible to adjust the transverse position during operation. The axial position of the films is automatically monitored and regulated in an optimum fashion. Overall, this provides the basis for a substantially improved sealing seam quality. In addition, there are hygiene-related benefits because mechanical braking systems and the dust discharge this normally involves are eliminated. And downtimes due to jammed or sticking rollers are also a thing of the past. Animal by-products from meat processing, such as skin, bones, blood and flare fat, are valuable raw materials. They can be processed into lard, tallow, collagen or gelatin. In addition to the processing itself, producers within the food production chain must meet high hygienic standards in terms of raw material quality and handling. The newly developed GEA hygienic decanter provides the highest hygienic standard available on the market. This high standard is achieved via special adaptations required for food processing. These include the use of FDA-approved components, modification of the surface roughness from Ra 4.0 μm to Ra 0.8 μm, and design of corners and surfaces with optimal cleanability, as well as a defined arrangement of spray nozzles. To improve decanter performance, GEA has developed the GEA PerformancePlus service tool. With its different service level options, GEA PerformancePlus extends way beyond routine preventive maintenance and complements the Industry 4.0 strategic efforts of GEA customers. The service tool provides maintenance, monitoring, analysis and optimization services. By combining modern condition monitoring technologies with its industry expertise, GEA experts carry out analyses and recommend measures for optimal plant operation. In turn, GEA customers receive valuable information so business decisions which impact performance-related goals are easier to make. GEA PerformancePlus creates transparency when it comes to the actual condition and status of the equipment, increases its availability, ensures optimum productivity, delivers efficiency optimization and enables sustainable equipment utilization. This service tool is currently available exclusively for Separation. An expansion to other product groups will take place in the future. Meet GEA at booth B5107 in Hall B at IPPE, Atlanta.